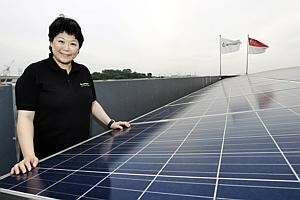 Along Tukang Innovation Drive in Jurong is a four-storey factory with solar panels on its rooftop. It has windows made of a special glass which blocks out the heat of the sun, so less power is needed to air-condition the building. Perhaps these features are not that unusual, but consider also the thought that went into the design of the facility even before the first brick was laid: "Green" cement and recycled concrete aggregate was used, and technology was harnessed to track the size of its carbon footprint right through its construction. This is GreenHub, Singapore's first "green" factory, which officially opened yesterday. The 180,000 sq ft facility belongs to Greenpac, a homegrown sustainable-packaging firm that walks the talk about being pro-environment. To sceptics who say going green is possible only for those with deep pockets, Greenpac chief executive Susan Chong makes the point that the factory was built at a cost of $20 million - within her budget. She told The Business Times recently in an interview ahead of the factory's opening: "We have a sustainable building doing sustainable manufacturing, coupled with people who go green. That's how we are different from the rest." GreenHub, which is Green Mark Gold-certified, is the first industrial building here to quantify its carbon footprint during construction; it did this with the help of A*Star's Singapore Institute of Manufacturing Technology. Ms Chong said: "We measured how much carbon was used to construct this building and that made us very conscious." Incidentally, carbon-footprint-wise, the building fared better than commercial buildings in Britain and Scandinavia, she said. GreenHub's rooftop solar panels are estimated to cut energy consumption in the building by at least 30 per cent; on weekends, when less energy is needed, the company sells the excess electricity supply generated by its solar panels back to the national grid. Each year, the solar panels generate 568,000 kilowatt hour (kWh) of energy, more than the 160,000 kWh that the office needs, which effectively makes the office a zero-energy set-up. The glass in the building is Vari-shield Thermochromic glass, which keeps the heat of the day out so air- conditioners do not work as hard; the warehouses have skylights and natural ventilation features, which also mean lower power usage. And the work desks in the premises are certified by the Forest Stewartship Council (FSC), an independent, non-government, non-profit agency which promotes the responsible management of the world's forests. Beyond its operations, GreenHub makes being "green" a way of life: Greenpac's staff plant vegetables and herbs for their own consumption using hydroponics and composting. Ms Chong added that a tank collects rain water, and a sensor detects when the plants - chosen for their drought-resistance - need watering. Greenpac came in for praise from Deputy Prime Minister and Finance Minister Tharman Shanmugaratnam, who was guest of honour at the opening. He said the company has shown it is possible to pursue commercial ends while contributing to a better environment and social well-being. He added that it has grown from a one-person start-up 10 years ago into a multi-million-dollar company, and has "done it in a way that shows how companies can get commercial advantage through environmental value, through environmental protection as a commercial strategy". The "green" factory is a dream come true for Ms Chong. On the factory not costing any more to snag the Green Mark Gold award, she said: "I didn't believe that I couldn't do it within my budget. I sat with BCA (Building and Construction Authority) officers, who coached me on the changes I had to make." She said she hopes to inspire other SMEs to go "green": "Going 'green' is now a necessity for them to continue to progress. "You can't expand regionally without sustainable practices. We hope to be a good role model and spur others to do better, so Singapore will become greener."